Butcher Block Oil, also known as cutting board oil, is a food contact safe oil to seal and protect your wood preparation items such as countertops and cutting boards. In addition to protecting your kitchen surfaces, it also creates a beautiful flat finish while bringing out the natural colors of the wood. All natural and FDA approved for food content. There’s nothing inherently special that makes a specific oil cutting board ready. It needs to be food safe like ours is, but there’s no magic going on here. We recommend the use of pure tung oil as a butcher or cutting block oil. Pure Tung oil is all natural, food safe and creates the most beautiful finish available. In most cases, you’ll want to use a solvent along with the Tung oil. Citrus solvent keeps things food safe and smelling great or you can use one of our pre-mixed options. You can’t go wrong with and you’ll protect your boards. Finding a great butcher block oil may not be the first thing on your to-do list when you’re fitting your dream kitchen or replacing an old cutting board, but perhaps it should be. How you choose to finish your work-in-progress could have a major impact on how you cook, clean, and live for years to come. The answer to safe surfaces your entire family can enjoy? Real Milk Paint has the best butcher block oil and your most natural option. WHAT OIL SHOULD I USE ON BUTCHER BLOCK? Why is your choice in butcher block oil so important? Simple: Your countertops and cutting boards can take a beating. From vigorously kneading some homemade pizza dough to breaking down a slab of wild-caught salmon to chopping enough veggies for several batches of your signature minestrone soup, your daily cook-and-clean routine is anything but gentle. You need a work surface that can withstand the culinary onslaught and welcome repeated wipe downs as well. You could opt for the cold, contemporary look of stainless steel or spring for granite, stone or tile, but the warmth of wood is undeniable. There’s something homey about using natural materials in the most trafficked room in your home. The trick? Keeping that look intact no matter how many sugar cookies you roll out and cut over the holidays. For protecting and enhancing your butcher’s block, wooden countertops, kitchen island, cutting boards, and wooden dishes and utensils, our butcher block oil is durable and will not wear. All of the Oil’s listed below are recommended and safe to use on your butcher’s block! All natural and FDA approved for food contact, Pure Tung Oil is one of the best oils for butcher block. It is a hard drying wood oil that enhances the natural color of the wood while providing a beautiful finish. This oil has no additives or metallic dryers in it, so its safe for you and your family. For an all natural wood oil for cutting boards and butcher block, buy a bottle of Pure Tung Oil today. For a deep, natural color to your butcher block and countertops, rely on Dark Tung Oil. Our oils are all natural and food safe. This means you are able to add depth to your wood grain, without harmful chemicals. Dark Tung Oil is non-carcinogenic and does not contain any PCB’s. Our Half & Half Oil is perfect for protecting cutting boards, countertops, and other forms of butcher block because it is all natural and food grade safe. The one to one ratio of cistrus solvent to pure tung oil allows for the oil to soak into the surface, making it great for large and small projects alike! 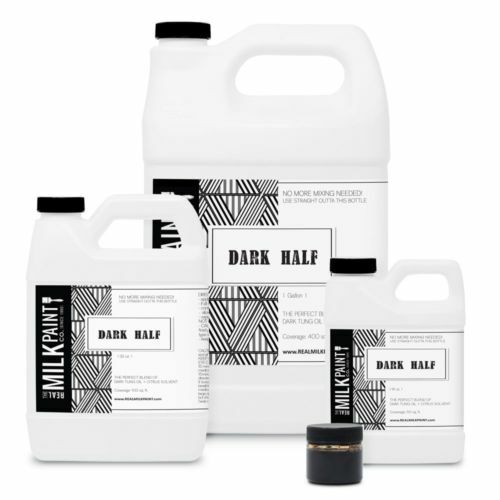 Our perfectly blended Dark Half is made of our Dark Tung Oil and our natural Citrus Solvent. Not only will this oil bring out the rich tones and wood grain, but it will also give a beautiful aged look to countertops, butcher block, cutting boards, and more. WHAT IS BUTCHER BLOCK OIL? Tung oil, also known as China wood oil and butcher block oil is what you get when you squeeze the seeds found inside tung tree nuts. Unlike more well-known oils made from olives or corn, this oil has a sort of magical secret: Expose it to air and it hardens into a to a tough, transparent seal inside your wood that looks rich but won’t rub off. This unique characteristic makes this oil ideal for butcher block, cutting boards, or finishing wood both inside and outside your home. Swab it on your deck, protect your planters or extend the life of your kids’ treehouse. Just save enough to complete your kitchen, because you’re going to want what butcher block oil has to offer in your cook space. No two oils are quite the same — something that is never more apparent than when you’re trying to choose a food-safe finish for your butcher’s block. Knowing that a substance will come into contact with your family’s food raises a whole host of questions: Is it toxic? Will it build up over time? What about contact or airborne reactions? It is Non-Toxic – Because our oil is non-toxic it’s safe to use on food surfaces such as your countertops, butcher blocks, cuttings boards, and more. It doesn’t dry, it cures. This is an important distinction because drying implies evaporation while butcher block oil cures or hardens into a protective, long-lasting coating. Once the oil is exposed to oxygen, it starts sucking up the compounds needed for polymerization, which is the chemical reaction that changes the oil’s consistency. It’s low allergy. If you suffer from allergies and need a safe butcher block oil, this oil is a promising candidate. While it’s possible that people with nut allergies could experience a reaction ( none have been reported in 20 years), butcher block oil is generally considered to be very low on the allergenic scale, and the fact that it cures to a hard, relatively impermeable finish adds to its low allergy nature. There’s no off-gassing. When some products are manufactured, gases become trapped or get absorbed in the material. Later, those gases are released, presenting a potential hazard. It contains no solvents, metallic dryers or volatile compounds that could eventually emerge and taint the air in your home sometime down the road. It’s water-resistant. Butcher block oil helps repel water, thereby protecting your wooden surfaces from spill-related warping and staining, and it fends off everything from orange juice to red wine and even acetone, just in case you known someone who likes to change their nail polish and chat while you cook. It’s environmentally friendly. If you have a preference for sustainable products, you’ll like our butcher block oil. With no petroleum distillates or other icky additives, this all-natural oil delivers durable results without using harmful products. Thinking about using butcher block oil on your outdoor projects? Butcher block oil is great to use on all your outdoor projects. It does not mold. Butcher block oil forms a barrier to prevent moisture from seeping into your wood surfaces, making it difficult for rot and mold to take hold. Give your kitchen a fresh look with butcher block oil from Real Milk Paint. Shop our butcher block oil in our online store now. Never any fillers, artificial thinners, or other questionable additives. Just high-quality butcher block oil you’ll be proud to use on your projects — kitchen and more. The surface should be dusted to remove all loose particles. For better penetration the oil should be thinned one to one with either our natural Citrus Solvent or Odorless Mineral Spirits for a less expensive alternative. Or just use the Half & Half or Dark Half products to use the oil right out of the bottle! Any wood filling or wood staining (water or alcohol stains work best) must be done before the oil is applied. Using the Pure Tung Oil straight from the bottle would only be for the most thirsty surfaces like old weathered wood, 100 year old wood floors that were never finished or concrete. For the majority of all projects, you will thin Pure Tung Oil 50% with thinners for the entire finishing process. The first coat of thinned tung oil should be a liberal one. Apply with a natural bristle brush, sponge brush, or a thin foam roller. Allow this coat to sit for a minimum of 40 minutes so the oil can soak in. When it soaks into the wood, apply another coat immediately. Continue to apply coats, one after another, until the wood/concrete is saturated and stays glossy for a minimum of 40 minutes up to 1½ hours. If eighty percent of area stays glossy, the wood cells are saturated and this can be considered your final coat. Now, wipe down the surface with clean rag material removing any excess oil that is on the surface. Continue to check for any seeping in the next few hours, and rub this off as well. Do not allow standing oil on the surface overnight. Any standing or puddles of oil should be wiped away with clean rags. After allowing the oil to soak overnight, apply one more coat to the surface the next day. Let this sit for a minimum of 40 minutes, but no more than 2 hours. Wipe up any oil that has not soaked in. Now the tung oil will be in its curing stage. Hang oil soaked rags up separately to dry. For woods with very dense pores like Teak wood, thin with two parts Citrus Solvent to one part oil will help it absorb better for every coat. Pure Tung Oil will take 7 to 10 days for a minimum cure and 15 to 30 days for a full cure. Do not sand between coats of tung oil. This is an application technique for tung oil varnishes, not pure tung oil. Tung oil can be applied pure to very porous surfaces or with Citrus Solvent added if a non-toxic finish is required. Thinners can accelerate the drying process and greatly improve the penetration by cutting the each coat of oil with Citrus Solvent, mineral spirits, or odorless mineral spirits by 50%. Do not use the “Green” thinners now being sold. They contain water and will not mix with the oil. Remember by adding petroleum mineral spirits or other thinners, the oil may become toxic with these substances mixed into it, although the finish produced is not toxic because the thinners evaporate. The number of coats of oil to be applied will be determined by the intended use of the piece. One to two coats are enough for decorative work, paneling and molding. For surfaces that receive moderate to heavy use or handling need a minimum of three and on up to six coats for maximum protection. Apply till the surface reaches the saturation point. This will be evident as the surface will not absorb more oil. Renewal and/or maintenance coats are thinly applied with cheese cloth, lint free cloths (old bed sheets work well), or old t-shirt material on an as need be basis. A two parts solvent to one part tung oil mixture is recommended for maintenance coats. Do not get hung up on the number of coats, let the wood tell you when it has reached its maximum saturation. Pure Tung Oil will be in the wood up to the surface not on the wood like varnish or Polyurethane top coat. The end result is more like seasoning a cast iron pan. This product will give you a surface that will stand up to vigorous use and spills: water will bead on the surface. After the tung oil as completely cured (minimum 30 days) cleaning of the surface can be done using hot water and mild soap, such as dish soap. Avoid using hard chemicals or acids for cleaning.